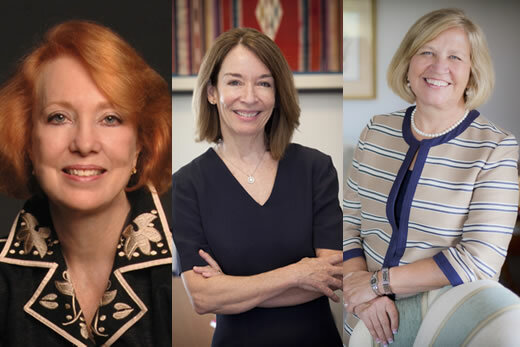 Three researchers from the Nell Hodgson Woodruff School of Nursing at Emory University will be inducted into the Sigma Theta Tau International Nursing Researcher Hall of Fame. Linda McCauley, RN, PhD, dean and professor; Deborah Watkins Bruner, RN, PhD, Robert W. Woodruff Professor of Nursing, and Elizabeth Corwin, RN, PhD, associate dean for research will receive the honor this July 2016 in Cape Town, South Africa. The International Nurse Researcher Hall of Fame recognizes nurse researchers who have achieved significant and sustained national or international recognition and whose research has improved the nursing profession and the people it serves. "We are so proud of our nursing leaders on their incredible achievement," says Sandra B. Dunbar, RN, PhD, associate dean for Academic Advancement. "They are all truly deserving of this recognition as their renowned research has blazed tremendous trails within the nursing field." Linda McCauley has more than 25 years of experience in conducting interdisciplinary studies focused on occupational and environmental studies of working populations and their children. She led a large study funded by the CDC/NIOSH on "Pregnancy Health Among Florida Farmworkers" from 2009-13. That work was followed by a 4-year R01 award, where she examined heat stress in agricultural workers in five Florida communities. She currently leads an NIH/EPA funded Children’s Environmental Health Center focused on the role of environment exposures and the microbiome on pregnancy outcomes and neurocognitive development of the children. Her research has also resulted in a powerful body of work that has influenced health policy on the risk of exposure to environmental toxicants and measures to reduce the probability of exposure in pregnant women and children. Deborah Watkins Bruner is an internationally renowned researcher, scholar, and mentor. She has been continuously funded in leading multi-disciplinary teams in patient-reported outcomes (PROs), sexual health, large national clinical trials focused on understanding and improving symptoms, as well as studies seeking to improve minority accrual to clinical trials. Her work has led to numerous honors and awards. Dr. Bruner has worked for over two decades with the National Cancer Clinical Trials Network (NCCTN). Dr. Bruner is the first and only nurse to lead, as Principal Investigator (PI), a National Cancer Institute (NCI) sponsored clinical trials cooperative group, the Radiation Therapy Oncology Group (RTOG) Community Clinical Oncology Program (CCOP) Research Base. In addition to being PI of the NRG cancer control program, Dr. Bruner is the only female scientist and only nurse to serve on the Executive Committee guiding the historic merger of the group. Elizabeth Corwin's outstanding contributions to nursing derive from her vision and leadership in three areas: advancing science and increasing awareness that adverse pregnancy outcomes, including preterm birth, postpartum depression, and postpartum fatigue, have predictable and preventable biological underpinnings; providing compelling evidence that exposure to racial discrimination during pregnancy leaves a biological fingerprint of disadvantage on a woman. Her NIH-supported research was the first in nursing to show that dysregulation in the postpartum psychoneuroimmune response increases the risk of postpartum fatigue and depression.Corwin is currently conducting two NIH funded research studies, the first focusing on the influence of the maternal Microbiome and chronic stress on birth outcomes in African American women, and the second, the influence of those prenatal exposures on the infant Microbiome and infant neurodevelopmentCorwin is also expanding the influence of Emory’s nursing research enterprise as a whole. Under her leadership, the school has been catapulted into the highest ranks of NIH funding (No. 4) among nursing schools.